The next day, she had a “My Fair Lady” moment. She says, “I jumped to my feet and yelled (to no one), By George, I’LL BECOME A REALTOR”!! (Just kidding. I didn’t really say “by George”)"
The journey to that end landed her at StagedHomes.com, a home staging training website, and they “just-so-happened” to be conducting a home staging class… a mile from her home and just a few weeks later. So, she decided to go for it. “It will be helpful for me as a Realtor”, she told herself. That Home Staging class changed the life of the 22-year restaurant industry veteran. During that class, her mind opened, and her life transformed. Just a few short weeks later, Stage Right Home Staging was born. Since that October in 2007, Theresa quickly became the area's "go to" home staging expert. She's earned her Master Home Staging Designation, Luxury Home Staging Specialist designation, Color Pro consulting designation, Life Coaching certification and has been coached and mentored by many business and personal coaches, including world renown Tony Robbins, Dr. Wayne Dyer, Jack Canfield, Louise Hay, Lisa Nichols, and no less than 5 of the original authors of the #1 best selling book, “The Secret”. Stage Right has grown from a few accessories in her basement to two warehouses with enough furniture and accessories to stage dozens of homes at a time – creating Delaware 's Premiere Home Staging Company -- and Stage Right continues to grow to serve the home staging and real estate community throughout Delaware, Pennsylvania, New Jersey and Maryland. Theresa’s time tested, expert advice and staging tips have been featured in local and national publications. As a certified instructor, she feels privileged to teach Realtors continuing education classes. Also, she is routinely invited to participate on real estate expert panels with top experts in the field, as well as to speak and teach at local, national and international real estate events. Mrs. Vallier-Thomas uses the tools and specialized knowledge she gained from her coaching education to effectively guide sellers through what is ranked as one of 3 most stressful of life circumstances – selling their home. Stage Right's tradition of home staging excellence has not gone unnoticed: in 2014, 2015 & 2017, Stage Right was voted "Best Designer/Decorator" in DelaWhere Happenings magazine's annual "Best Of" awards. In 2018, the Delaware home staging professionals were awarded the IAHSP "Staging Trifecta", receiving the highest Home Staging industry award: The IAHSP Excellence in Home Staging, Customer Service and Industry Leadership award. Additionally, the company won the 2018 awards for "Best Vacant Staging" and "Best Occupied Staging". Theresa has had the honor of speaking on the very same stage with the legendary motivational speaker and coach Les Brown. In February 2017, she shared an international stage with Jeff Lewis (of TV’s “Flipping Out” Fame) at the annual International Association of Home Staging Professionals (IAHSP) Educational Conference in Ft. Lauderdale, Florida. In October 2018, the Stage Right team had the privilege of being mentored by Jonathan and Silver Scott (better known as “The Property Brothers") and most recently, she has accepted the invitation to speak in Nashville, TN in October, 2019 on the very same stage as HGTV’s Candice Olson and BravoTV’s Carson Kressley and Thom Filicia, hosts of “Get a Room” -- formerly of “Queer Eye for the Straight Guy” fame. 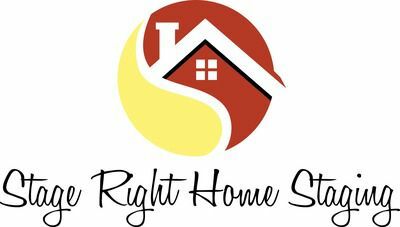 Stage Right’s client list includes hundreds of Realtors, dozens of home builders and real estate investors, thousands of individual home sellers and several apartment and condominium communities. Theresa and the Stage Right team have also been honored to serve non-profit agencies including Habitat for Humanity, Stephen Siller Tunnel 2 Towers Foundation, Delaware Housing Opportunity Fund, Inc. (DEHOFI) & Interfaith Community Housing. Through their business and Theresa's teaching and speaking engagements, Stage Right touches the lives of thousands of people each year. Stage Right Home Staging is headquartered in Wilmington, DE, where Theresa lives with her handsome and charming husband, Shawn, her 2 beautiful stepchildren, Caleb (18) and Blythe (15), their 2 adorable Cavalier King Charles Spaniels, Maisy and Marley and 1 cuddly Tuxedo cat (who thinks she’s a dog), Karma.